The guiding idea behind the media performance "Where's the key?" on Düsseldorf's Burgplatz was to resurrect local history in the sense of 'flux' and to keep it alive. Different generations of innovators, the culture creators and pacemakers who keep the city's artistic heart beating, were brought together on this evening. The public place, "Burgplatz", was transformed into a communication platform and stage. Based on the principle of "BOOTSCHAFT", the microcosm of a particle of patina taken from the Schlossturm tower was photographed and digitised under a video microscope. These data were taken as the basis for a video animation which was shown on a media sculpture on Burgplatz. The sculpture was shaped from the coordinates of a regular octagon and it is the central object of BOOTSCHAFT's "original anchor". The original anchor is a connecting element that appears in all BOOTSCHAFT media performances. This light sculpture not only illuminated the innovators and the historic Burgplatz, it also created a symbolic link to modern Düsseldorf by pointing towards the recently built Media Harbour. A newspaper was presented in a diplomatic limousine during the light performance. 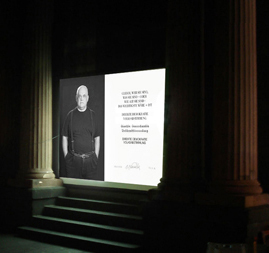 Around one hundred portraits of the participating innovators were documented in the newspaper, and projected simultaneously on the Schlossturm's entrance. "City and art exist at the level of subconscious living. The former because it is collectively created and the latter despite being created by individuals. Yet the difference is only imaginary and it disintegrates on closer inspection because the city is created by the public, yet art is created for the public. And the public is the common denominator defining the conditions under which both originate."